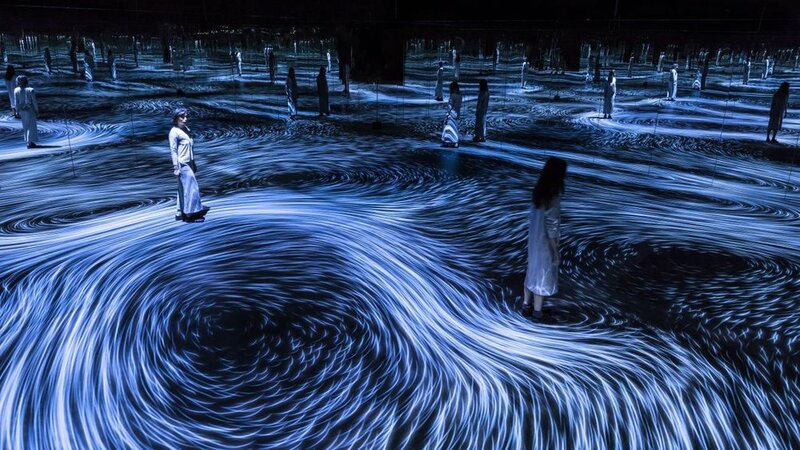 Japanese collective teamLab's immersive installations and artworks blend technology and creativity bringing together ‘ultratechnologists’ from diverse digital fields. The Fizz chatted to director Shizuka Sasaki at Sydney’s Powerhouse Museum, host to exhibition ‘Learn & Play! teamLab Future Park’. Throughout our artworks and spatial design we try to make other people’s existence a positive thing. With conventional art, like the Mona Lisa, you want to look at it by yourself and not be distracted by others, but in our artworks there’s always interaction. If someone’s touching it, or sharing the space, it changes around that person and makes the artwork beautiful. So those viewing it appreciate other people’s existence. We create a positive relationship between yourself and others. It was started by our founder Toshiyuki Inoko with five people in 2001, but has grown to over 500. Most of us are permanent, but some work on a contract basis. I’m a catalyst for teamLab. A catalyst creates a team of people to make each project happen, drawn from different technologies. Sometimes we need mathematicians, sometimes special sensor engineers, or artists, designers or architects. So we gather specific teams and liaise through meetings. What inspired your touring show ‘Learn & Play! teamLab Future Park’? We began as an IT company. When one of the co-founder's sons was little, he noticed kids were just playing by themselves on phones and tablets, not playing together. He was shocked, so took away the child’s phone. But then he thought, ‘I’m in the IT industry, why am I taking technology away from my son? Technology should be able to bring people in, and let them play together or be more creative with each other.’ So that’s how we started developing the idea of bringing kids together to interact and play through technology in this Future Park. Even though we use technology it’s not just for one person, it’s for a lot of people. Everything is interactive, so if you’re playing by yourself – as with our coloured 'Light Ball Orchestra' exhibit – it’s fun, but if there were more people it would be a lot more fun. There would be more sounds, interactions and colour, so it gets better. In Future Park's 'Sketch Town' zone kids can scan their coloured-in drawings into a digital artwork and then move them around by touch. How does it work? There are around 12 different things you can draw and put into 'Sketch Town'’s world. You can touch the pictures and move them around, and they will jump and dance. There’s a limitation to the artwork’s screen size, so once around 300 to 350 drawings appear on it, then your spaceship, say, or truck will start fading away, but they will last for a few hours. How important is interactivity to your work? Everything is interactive. We don’t want to create artworks that you just watch. We want people to be involved and actually to affect the artwork itself. Why did you choose art as your medium? It could have been any medium because our aim is to change people’s perspective. We wanted to create something that isn’t just a Japanese thing, but a universal concept. That’s why art is good to work with. We get inspiration from everything – art and architecture – but often from nature. We always blur the boundaries between science and art, and realistic things and virtual things. When you look at flowers, distant mountains or waves you think, ‘why are they so beautiful?’ We break down why they’re beautiful and create something from that concept. Tell us about your recent digital installation for Melbourne’s ‘NGV Triennial’ exhibition? The 'NGV Triennial' piece was a vortex on the floor, which responds to people’s movement like water. The faster the person moves, the stronger the force is applied in that direction. If a person is not moving, no flow will occur. Our artworks keep changing, synchronising with nature, weather or real places. We can’t give away exactly how we connect them to the outside world, but there's something like a GPS always talking to the system, and we create an algorithm. Perhaps the weather outside will affect the weather inside the artwork, or alters the behaviour of its inhabitants. Artworks change with the seasons or time of day. One client bought this ever-changing floral artwork, went on holiday and came back to find the flowers were totally different. They called us to say they liked it better before, but we told them they would have to wait a year to see their favourite July flower again! We have Facebook, Twitter and our favourite Instagram. Instagram works well for us because our artwork is very photogenic, so people like taking pictures at our exhibitions and posting them online. We do a lot of projects all over the world, so I travel all the time. After this I go to China. We get inspiration from everywhere, with shows like ‘Future Park’ touring from Asia to the US and Europe. On 21 June we have a huge permanent exhibition coming up called 'teamLab Borderless' about transcending borders. It’s at the MORI Building in Odaiba, Tokyo, and involves 520 computers, 470 projectors, 40 artworks and 10,000 square metres of three-dimensional space. We’re exploring the idea of connecting all the artworks together so there will be no borders between them. Everything is linked in some way, so for instance those little guys you’re looking at will go out of the artwork and go into another world or appear over there. We also have a Paris exhibition starting in May called ‘teamLab Au-delà des limites’. ‘Learn & Play! teamLab Future Park presented by Toyota’ is at the Powerhouse Museum, 500 Harris Street, Ultimo, Sydney, Australia, until 30 April 2018. It will also open at Yang Art Museum, 3rd Floor, Building 14, Solana, No 6 Chaoyang Park Road, Chaoyang, Beijing, China from 25 June to 7 October 2018. Catch ‘teamLab Au-delà des limites’ at Grande Halle de La Villette, Parc de la Villette, 211 Avenue Jean Jaurès, Paris, France, from 15 May to 9 September 2018. ‘Epson teamLab Borderless’ will be on show permanently at Mori Building Digital Art Museum at Palette Town, Odaiba, 1-3-8 Aomi, Koto-ku, Tokyo, Japan, from 21 June 2018. See teamLab exhibitions for other current and future installations.